The Delhi government is likely to extend the ongoing Winter Session to allow passage of the Jan Lokpal Bill which was cleared by the cabinet earlier this week. "The government will table the Bill next to next week and for that the Session needs to be extended as it is scheduled to end on November 28," a senior official said. 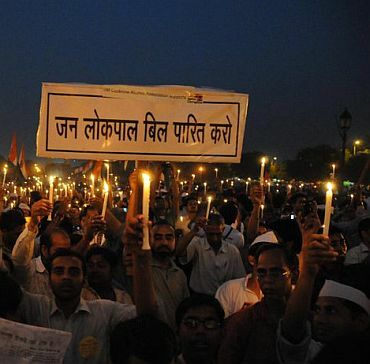 The government had cleared the Jan Lokpal Bill on November 18 when the Session began, paving the way for creating the post of an anti-graft ombudsman, which it claimed was similar to the one proposed during the Anna Hazare movement. The long-pending report of the Fourth Finance Commission on municipal corporations will be tabled next week among other bills. "Then we will decide about when the report will be tabled," the official said. Earlier on Friday the house saw unruly scenes over the issue when Bharatiya Janata Party MLAs demanded the immediate tabling of the report. "The government has decided to table the report and the Business Advisory Committee will decide on the date," assembly speaker Ramnivas Goel said. Goel also questioned Leader of Opposition Vijender Gupta, asking as to why the BJP did not table the bill in 2012 when it had around 25 MLAs. Deputy Chief Minister Manish Sisodia on Friday also tabled the Delhi School Education Amendment Bill and the Delhi Schools Verification of Accounts and Refund of Excess Fee Bill.